Dr. Martin Luther King Jr. addressing the crowd at the 1963 March on Washington. Today is Martin Luther King Jr. Day—a nationwide day of service celebrating a visionary who challenged the nation to recognize the inherent potential in each American citizen. As the most visible spokesperson and leader of the civil rights movement, Dr. King inspired millions of people to value every individual and recognize that our country would be stronger when everyone was given equal opportunity to maximize their potential. Delivered at the base of the Lincoln Memorial during the 1963 March on Washington for Jobs and Freedom, Dr. Martin Luther King’s iconic “I Have a Dream…” speech galvanized new support for the civil rights movement. It fueled the momentum created by the 1954 Brown v. Board of Education decision, Rosa Parks and the Montgomery Bus Boycott in 1955 and a series of non-violent sit-ins in 1958, helping to pave the way for the 1964 Civil Rights Act. 250,000 people gathered in Washington D.C. to participate in the March on Washington and listen to Dr. King speak to the injustices African Americans still faced 100 years after the signing of the Emancipation Proclamation. Dr. Clarence B. Jones—advisor, personal counsel, speechwriter and friend to Dr. Martin Luther King Jr.—takes notes behind Dr. King at a press conference regarding Birmingham, Ala., in February 1963. Like many Americans, each time the third Monday of January comes around, I hear those four words echoing in my head, “I have a dream…” Just over two years ago, I had the privilege of sitting in on an interview with Dr. Clarence B. Jones—former advisor, personal counsel, speechwriter and friend to Dr. King—at the Communications Network Conference. The insights he shared about the making of Dr. King’s stirring “I Have a Dream…” speech resurface whenever I hear those four words. Learning about the process that brought that critical speech to life has left a lasting impression on me. At the conference, Dr. Jones shared that in the month leading up to the March on Washington, Dr. King and his family stayed at Dr. Jones’ New York home. Dr. King and his inner circle understood the significance of a march supported by such a wide range of stakeholders—including leaders from labor unions, social service associations, civil rights groups, student organizations, academia and multiple religious organizations. 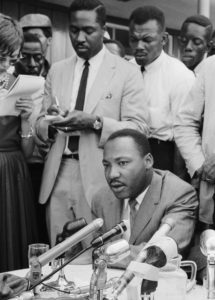 With his confidants, Dr. King deliberated over how to frame his call-to-action to magnify what they believed would be a pivotal moment for the movement. With the March quickly approaching, Dr. King asked Dr. Jones to draft some notes synthesizing their conversations. Compelled to support the movement and his friend who had this monumental responsibility ahead of him, Dr. Jones returned with the requested notes as well as a hand-written draft of seven paragraphs that would go on to become the opening of the “I Have a Dream…” speech. Reflecting on the lasting impact of the March on Washington, Dr. Jones compared what happened next, as Dr. King spoke those celebrated words with impassioned conviction, to catching “lightning in a bottle.” A fervent combination of planning and impromptu expression from the heart was delivered to our country—at the right time, by the right man, in the right place. 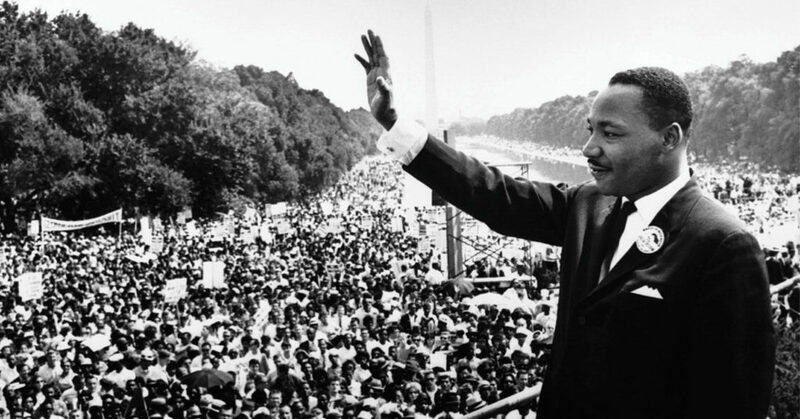 Dr. King’s full “I Have a Dream…” speech can be watched here and read here. As the interview of Dr. Jones concluded, there was not a dry eye in the conference hall. The entire audience rose to give him a standing ovation, moved by his lifelong dedication to civil rights and his commitment to keeping Dr. King’s narrative alive. I will always be grateful for the insights he shared that day, helping us all realize just how many people and efforts had to align to create the moment that was the “I Have a Dream…” speech. May the dream Dr. King was inspired to share on August 28th, 1963 continue to be the guiding vision for our country—while we’ve made progress, I believe Dr. King would agree we still have a long way to go. This entry was posted in Beyond Levitt, Holidays and tagged Dr. Martin Luther King Jr. on January 15, 2018 by Nicole McGaffey.